using various instruments of the geometry box-ruler, compass, protractor, divider, set square etc. construction of lines and angles. construction of parallel lines using different techniques- paper folding, set square and using compass. to identify whether a triangle can be constructed with the given measurements. construction of triangles with given measurement of sides and angles. We know parallel lines are lines that never meet. Now let us learn to construct parallel lines. 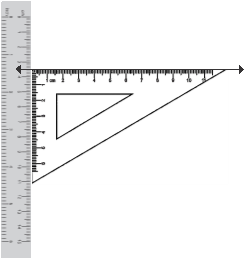 angle along the line l.
4.Slide the set square along the ruler upwards such that point O lies along the arm of the set square. 1. Draw a line l and take a point A outside the line. 2. Take any point B on the line. Join A to B. 3. With B as the centre and any convenient radius, draw an arc intersecting line l at P and AB at Q. 4. With A as the centre and the same radius draw an arc to intersect AB at R.
7. Draw a line through A and S. m is the required line parallel to l passing through the point A. Remember only one line can be drawn through A which is parallel to l.
We have already studied parallel lines and their properties. We know that when 2 parallel lines are intersected by a transversal, the alternate angles so formed are equal. The above construction has been done using the same property. When 2 parallel lines are intersected by a transversal, then the corresponding angles so formed are also equal. Using this property, construct a pair of parallel lines. Construct a perpendicular on the given line. Take a point at the given distance on the perpendicular. Construct a parallel line at that point as in the previous construction. Example 1Draw a line l. Draw another line m parallel to l at a distance of 4 cm from it. Qualified writers in the subject of mathematics are ready and waiting to help you with your studies. Take a point C on the line l.
Draw a perpendicular at the point C.
On the perpendicular mark a point at a distance of 4 cm from C (say G). At G draw a GH perpendicular to CG. (since the sum of the interior angles on the same side of the transversal CG is 180°) Thus, m ï£¬ï£¬ l at a distance of 4 cm from l.
b. by drawing corresponding angles. 2. Draw a line AB. Draw a line CD perpendicular to line AB. Now on CD mark a point P at a distance of 4.5 cm from C. At the point P draw a line parallel to given line AB. 5. Draw a line XY= 8 cm. On the line XY mark a point A, 3 cm from X. At the point A draw a perpendicular AB to the line XY. Mark a point M on AB at a distance of 4 cm from A. draw a line CD parallel to XY passing through M.
6. Draw a line parallel to a given line at a distance of 5.5 cm from it. of the 3 conditions given below are fulfilled. Two sides and the included angle are given – SAS criterion. One side and any two angles are given – AAS criterion or ASA criterion. Use a compass to draw angles of special measures – 15°, 30°, 45°, 60°, 75°, 90°, 105°, 120°, 135° etc). For others you can use a protractor to construct triangles with given angles. 3 angles are given since the length of sides can vary. The triangles will be of the same shape; however the length of the sides will be different. 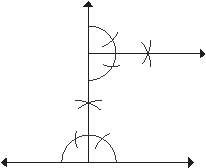 Two sides and the non – included angles are given. Before we construct triangles we should make a rough sketch showing all the given measures. Construction of triangles when 3 sides are given. 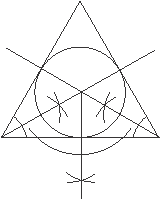 A triangle can be drawn only when the sum of any two sides is greater than the third side. When three sides of a triangle are given, check whether the sum of any two sides is greater than the third side. If yes, only then the construction is possible. Example 1Which of the following can be the sides of a triangle? Since the sum of any two sides is greater than the third side hence these measures can be the measures of a triangle. Example 2Construct a triangle ABC such that AB = 6 cm, BC = 5 cm and CA = 9 cm. In triangle ABC, 9 + 6 > 5, 6 + 5 > 9, 9 + 5 > 6 ∴ triangle ABC can be constructed. Draw a rough sketch of the triangle ABC. Join A to C and B to C. Triangle ABC is the required triangle. Example 3Construct a triangle PQR with PQ = 7 cm, QR = 6 cm and ∠PQR = 60°. 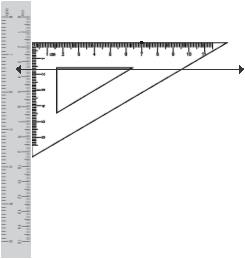 Draw a line segment PQ of measure 7 cm. Using a protractor or a compass construct an angle of 60° at the point P.
Example 4Construct a triangle ABC with ∠B = 60°, ∠C = 70° and BC = 8 cm. At C draw ∠QCB = 70° using a protractor the point off intersection of PB and QC is the vertex A.
Triangle ABC is the required triangle. To construct a triangle when the side is not the included side in the given angles, we will first the third angle using the angle sum property and then consider the given side and the two angles that include that side to construct the triangle using ASA construction criterion. Example 5Construct a triangle PQR with ∠P = 110°, ∠Q= 30° and QR = 6.5 cm. The given side QR is not the included side between the given angles ∠P and ∠ Q. We know sum of angles of a triangle = 180°. 90° as it is a right triangle. Draw a line segment XY = 3 cm. Triangle XYZ is the required triangle. Remember in a right triangle, the hypotenuse is the longest side. 2. Which of the following measures will form a triangle? Why or why not? 2. Construct a triangle ABC with each side measuring 6 cm. Measure the three angles of the triangle so formed. 3. Construct a right triangle PQR right angled at P with PQ = 4 cm and PR = 6 cm. 4. Construct a triangle XYZ with ∠X = 60°, ∠Y = 45° and XY = 7 cm. 5. Construct a triangle PQR with PQ = 6 cm, PR = 8 cm and ∠Q = 75°. 7. Construct a triangle LMN with LM = LN = 5.8 cm, MN = 4. 6. What special name is given to such a triangle? Construct a triangle PQR with measures of sides PQ = 4.6 cm, QR = 5.6 cm and PR = 6.5 cm. 2. From the point O draw a perpendicular to any side of the triangle. Name the point where it meets the side as M.
3. With O as the centre and radius OM draw a circle.O Does the circle touch all the sides of the triangle? Can you draw another circle larger than this which can fit into the triangle? No the inscribed circle is the largest circle that will fit inside the triangle. Materials required: compass, ruler, paper, pencil and colours. 1.Make a sketch of your initials and identify where each construction will be used. 2.Construct using a compass and a ruler. 3.Colour the alphabets and make them as creative as you can. A parallel line to a given line can be drawn at a given distance from it. A triangle has 6 elements in all- 3 sides and 3 angles. A triangle is possible only if the sum of any 2 sides is greater than the third side. a.The sum of angles of a triangle is . b.A triangle has elements. c.If 2 angles and the side are given, a triangle can be constructed. d.In a triangle PQR, ∠ P = 45°, PQ = 7.5 cm and PR = 6.3 cm, then triangle PQR can be constructed using criterion. e.To construct a triangle with given sides, the sum of 2 sides should be than the third side. 2.Which of the following can be the sides of a triangle? a.AB = 5 cm, BC = 7 cm, AC = 13 cm.b.∠A = 45°, ∠B= 65°, AB = 7 cm. 4.Draw a line parallel to a given line at a distance of 7.5 cm from it. 5.How many lines parallel to a given line can be drawn through a point outside the line? Why? 1.Draw a line segment AB = 6.4 cm. On AB take any point P. At P draw perpendicular PQ to AB. On PQ mark a point at 5 cm from P. Draw a line parallel to given line AB. 2.Draw a right triangle PQR right angled at Q with PQ = 7 cm , QR = 6 cm. through P draw a line parallel to QR and through R draw a line parallel to PQ intersecting each other at S. measure PS and RS. What is the name of the figure so obtained? 3.Construct an isosceles triangle ABC with AB = AC= 7.5 cm and ∠A = 75°. 4.Construct an equilateral triangle LMN with each side measuring 6 cm. 5.Construct a right triangle XYZ with XY = 6.5 cm, YZ =8.5 cm and ∠X = 90°. 6.Construct an obtuse triangle ABC with ∠B = 135 °, AB = 7 cm, BC = 8 cm. 8.Construct a triangle ABC with ∠A = ∠B =75°, and AB = 7.4 cm. What is the special name given to such a triangle? 9.Construct a triangle XYZ with XY = 5.4 cm and ∠X=60°, ∠Z = 60°. Measure the length of YZ and XZ. What is the special name given to such a triangle? 10.Construct a triangle ABC with the ∠B = 105°, AB= 6.3 cm and BC = 5.6 cm. "Maths Teaching Guide: Geometrical Constructions." UKEssays.com. 11 2018. All Answers Ltd. 04 2019 <https://www.ukessays.com/essays/mathematics/maths-teaching-guide-geometrical-constructions.php?vref=1>. "Maths Teaching Guide: Geometrical Constructions." All Answers Ltd. ukessays.com, November 2018. Web. 24 April 2019. <https://www.ukessays.com/essays/mathematics/maths-teaching-guide-geometrical-constructions.php?vref=1>. UKEssays. November 2018. Maths Teaching Guide: Geometrical Constructions. [online]. Available from: https://www.ukessays.com/essays/mathematics/maths-teaching-guide-geometrical-constructions.php?vref=1 [Accessed 24 April 2019]. UKEssays. Maths Teaching Guide: Geometrical Constructions [Internet]. November 2018. [Accessed 24 April 2019]; Available from: https://www.ukessays.com/essays/mathematics/maths-teaching-guide-geometrical-constructions.php?vref=1.